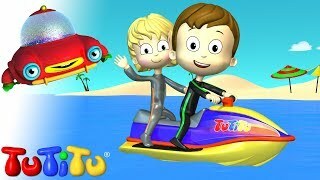 In this episode: TuTiTu creates a jet ski! You can use this video to teach toddlers prepositions by talking about what you see on the screen and using words like "into", "on top of" etc. Have fun! Treehouse TV is a Canadian English language cable television specialty channel with programming targeted towards preschoolers that was launched on November 1, 1997. TuTiTu - The toys come to life is a 3D animated video series for toddlers. Through colorful shapes TuTiTu will stimulate the children's imagination and creativity. TuTiTu Jet Ski | How To Save Money And Do It Yourself!